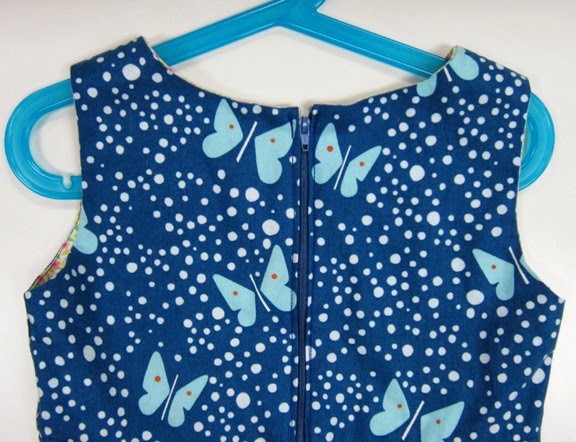 Blotch and Thrum: Butterfly dress! My elder daughter just turned seven (gasp) and I made her a dress from this precious Lizzy House fabric*. (Let me tell you how excited I am that there will be new versions of this print. So. Very. Excited.) We tried to have a photo shoot. There was a lot of trouble with the fans. It turns out that Emily made a dress from the same fabric for her daughter (I believe it's a geranium) so I borrowed it for my own other child so that she would coordinate. And you can see the super sweet lining fabric! 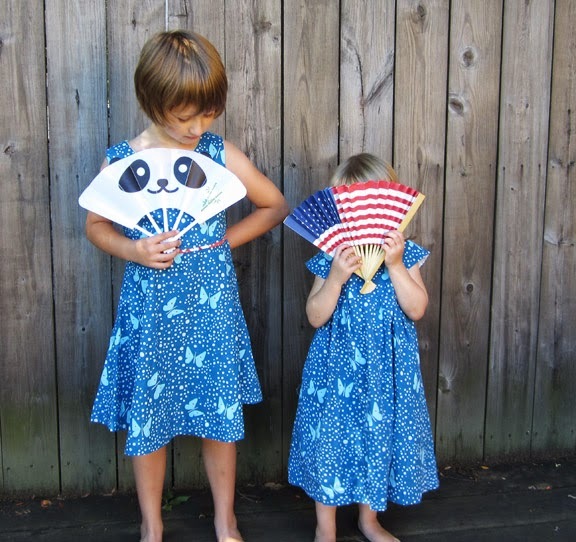 This dress is Butterick 3714, veiw B (no cowl, no sleeves). And the 7 fit her without adjustments. So, I'm happy with that! I did a fully lined bodice, but did not line the skirt. 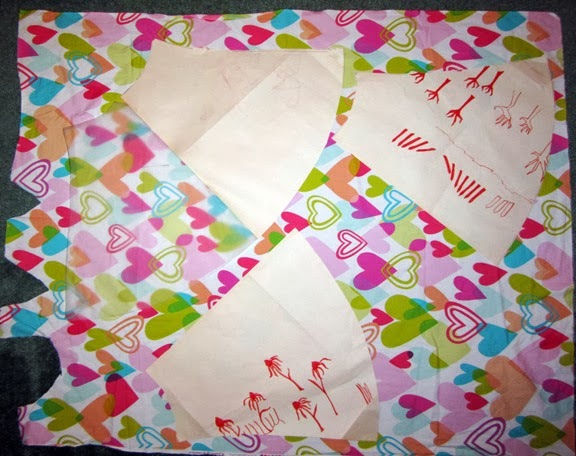 I drew out the pattern using the skirt lining length as the skirt length (the pattern is for a tea length dress - which would not be something this child would wear) because I did not have that much fabric. I was worried that it would end up too short, and would need a contrast band (hence the piping (the same butterflies, but in coral), which was laying the groundwork if that eventuality arrived, since the band would have been that coral fabric again), but this is a great length, so I didn't. I used the super seam #2 from Made by Rae's fantastic tutorial, which is probably overkill on a dress. But I had (still have) loads of trouble with unraveling seams from the dragon dress, so I'm much more conscientious about that now. I machine sewed the lining to the bodice proper, rather than hand stitched it (and I did that as well on the dragon dress after having to re-stitch the hand stitching on it 2 or 3 times) so that there is no way they will come apart. I don't care that you can see the stitches (and actually, it's not that noticeable) but I feel confident about it not coming apart in the washing machine, which is much more important to me than outward perfection. 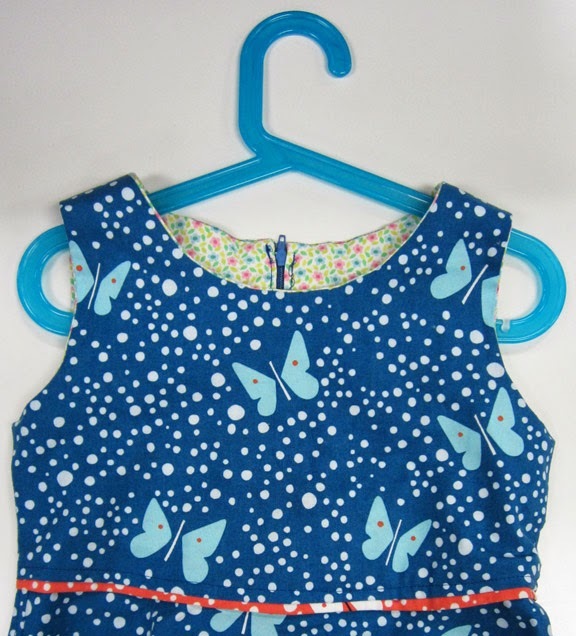 I like the two butterflies side by side on the back - totally an accident! I thought the pattern was fine, I would totally make this one again. But maybe I lucked out with my child being just the size for it without alteration. I am only sad about the zipper... which could have been done better (it's a tiny bit skewed). And, honestly, I thought the pattern directions for installing the zipper were extremely unhelpful (and possibly impossible to follow). But being able to install a zipper neatly will be a skill that will come with practice, at least, I hope so. Also, I couldn't figure out a good way to protect those seams with the confusion of an added zipper, and just ended up pinking them. The next dress is going to button up... I need a break from zippers! 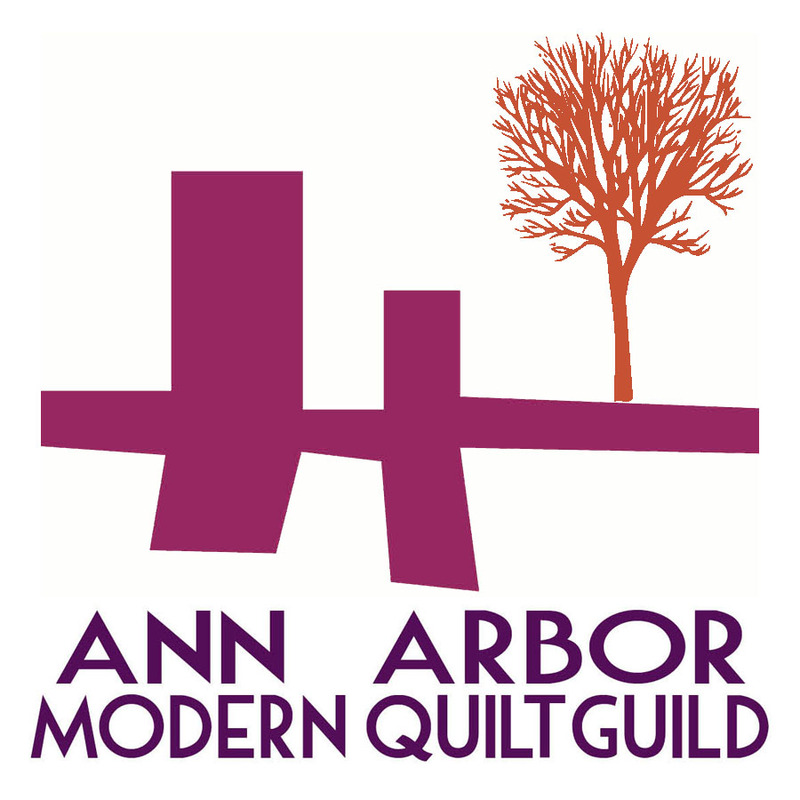 I worked on this at the SE MI crafty meet up, and got a lot of good advice from the other sewists there, I am not the most confident seamstress around, especially with my precious Lizzy House fabric. I'd like to thank Karen LePage especially for her input and hand-holding. Her advice was: cut out the bodice and sew it up, and then decide whether or not you have enough fabric for the skirt. And I decided it by making scrap paper skirt pattern pieces and cutting them down (up?) at the hem until I could fit all four of them onto the fabric. Not that I would make a bias-cut skirt out of so definitely vertically patterned fabric. And finished with a blind hem! I measured the hem with my Dritz EZY-hem Gauge, an amazing metal ruler (straight on one side, curved on the other) you can iron on. I do hate hemming above every other tedious thing that sewing sometimes involves, but this makes it much less painful than juggling those sliding rulers was. I love the picture! And the dress!